Solar and renewable energy is getting hot, thanks to nanoscientists — those who work with materials smaller than the width of a human hair — at the U.S. Department of Energy’s (DOE) Argonne National Laboratory who have discovered new, better and faster ways to convert energy from light into energetic electrons. Their innovative methods could provide new opportunities and greater efficiencies for solar energy conversion applications. Argonne scientists and their collaborators created hybrid nanomaterials — measured in billionths of a meter — at the laboratory’s Center for Nanoscale Materials (CNM), a DOE Office of Science User Facility, to harness the full energy of photons. The result was energetic, or ​“hot,” electrons, which carry the same amount of energy as a photon that strikes nanomaterial components. These little dynamos could eventually lead to big advances in photocatalytic water splitting — in which special materials convert solar energy into clean and renewable hydrogen fuel — and photovoltaics, which convert solar energy into electricity. The research team focused on metals and metal nanostructures because they absorb a great deal of light, which is the first step to increasing the number of energetic electrons in an illuminated material. The researchers simulated the material to determine the structural geometry and spectral conditions that would create the largest number of hot electrons. The winning combination: silver nanocubes and gold films separated by aluminum oxide spacers. 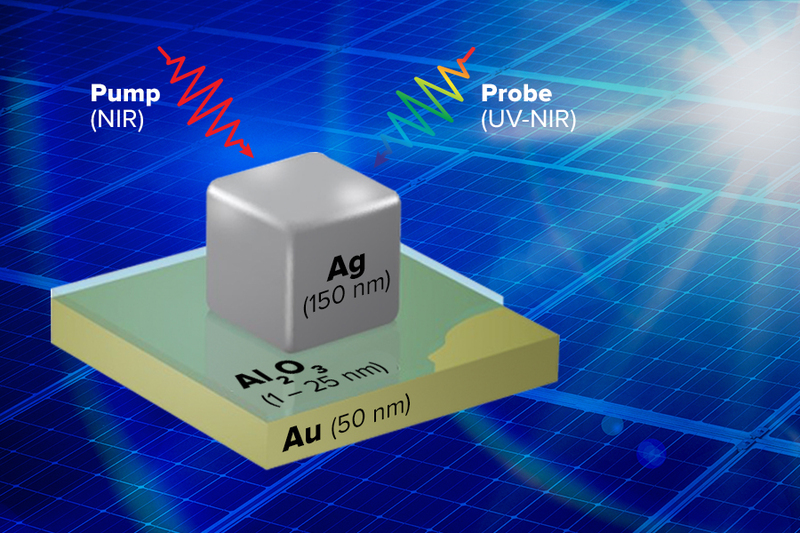 The coupling between the silver nanocubes and gold film across the spacer layer produces a large local enhancement of the light intensity. This, in turn, allows the winning nanostructure to crank out hot electrons better than its competitors. “One of the key advances is our ability to produce energetic electrons over a very broad spectral range — from the ultraviolet through the visible and into the near infrared,” Wiederrecht said. Processes for converting sunlight to energetic electrons typically work within smaller bands of wavelength. ​“That’s less useful for solar energy opportunities than if you could create hot electrons over a much broader spectral range,” he said. The team’s challenge: In most metals, energy cannot transition from one level to another to create high-energy electrons. “You need to change the direction of the electron motion or change their momentum to enable these transitions,” said Matthew Sykes, a co-author and postdoctoral appointee at Argonne’s CNM. The team gathered data using a state-of-the-art instrument: the CNM’s transient absorption spectrometer. With it, the team measured the rate of change in the concentration of hot electrons and determined how and when they lose energy. The data they collected could enable researchers to discover clues about how to counteract the loss or find a way to extract the hot electrons before they lose energy. The data also revealed distinct populations of hot electrons. “We see multiple, distinct decay rates that are wavelength- and geometry-independent,” Sykes said. The nanomaterial contains differing bands of energy affecting the decay rate of the hot electrons traveling within those bands. The research further revealed that the nanomaterials allow the different types of hot electrons to travel in certain directions. Other Argonne co-authors from CNM include David J. Gosztola, principal technical specialist for nanoscience; Daniel Rosenmann, principal engineering specialist; and Alex B.F. Martinson, chemist in Argonne’s Materials Science division. The work at the CNM, a DOE Office of Science User Facility, was supported by the DOE Office of Science. Collaborators were also supported by the Argonne-Northwestern Solar Energy Research (ANSER) Center, an Energy Frontier Research Center also supported by DOE’s Office of Science; the Air Force Office of Scientific Research Young Investigator Research Program; the Army Office of Research; the Volkswagen Foundation in Germany; and the Changjiang Chair Professorship in China.